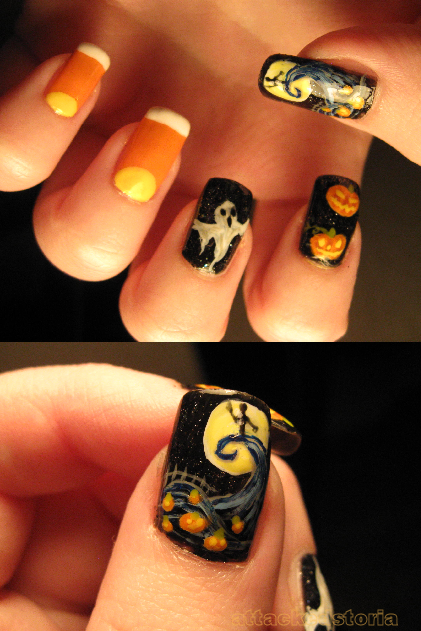 Attackedastoria Nails: This is halloween.. early! Anddd I'm back! Since I've been feeling a bit better, I decided to give nail art another shot. It's been getting cold and fall-ish outside, so I thought I'd practice doing something halloween-ish. I like the angry pumpkin on you pointer finger the best! Did you free-hand that Nightmare Before Christmas one? That's AMAZING. out of curiosity, what do u use to draw? like a nail art pen..? toothpick? I use small paintbrushes, usually.